The Failure Modes, Effect and Analysis (FMEA) aims at identifying the asset function, failure modes, cause, detection and their consequences as well as recommendation to mitigate the risk of such failures. Identify potential failure modes for a product or process in the development phase (DFMEA) to improve product or guarantee product quality as well as during the operational phase (PFMEA) to analyze critical equipment. Provide risk or critical assessment associated with those failure modes, regarding frequency of occurrence, severity and detection and prioritize issues for preventive action. Support the RCM analysis as a baseline to define the best maintenance policies for each equipment and components. Drive Quantitative Accelerated test in order focus on main failure causes (product weakness) to improve the product and reliability prediction. Integrates with Reliability Growth management policies (identify failure modes discovered during testing, update probabilities of occurrence based on Reliability Growth testing data). Drive HALT test in order focus on main failure causes (Robustness). Analyses equipment failure effect on other equipment as well as in the whole process (SFMEA). Risk matrix and RPN concepts. FMEA applied in different asset life cycle, such as design, manufacturing, commissioning and operation. FMEA case studies applied to different equipment such as pumps, compressors, valves. THE FMEA training can be customized to the client demand and be performed together with other training concerning a client cases study assessment. The main RCM (Reliability Centred Maintenance) focus is defining equipment component maintenance policy based on several criteria like, failure, cost, reliability and safety. Actually, RCM is a guide which support Maintenance Managers to take decision a long time performing maintenance based on planning developed in RCM analysis. The main objectives of RCM are to identify the inspections, preventive and corrective maintenance tasks required to sustain the maximum level of reliability, operational availability. To identify specific scheduled tasks required to mitigate failure modes consequences identified from the High Level review. To identify critical components in term of repair and replacement. To provide a baseline to define spare parts policies. To provide information for Life cycle cost analysis. Maintenance strategy concepts applied to different types of maintenance such as corrective, schedule and predictive maintenance. RCM integrated with FMEA analysis. 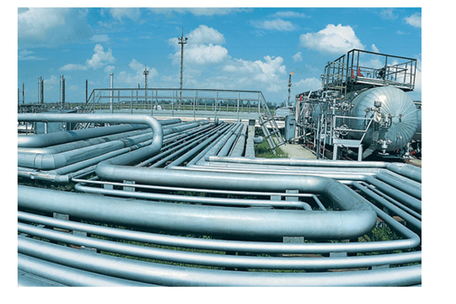 RCM applied in different asset life cycle, such as design and operation. RCM case studies applied to different equipment, such as pumps, compressors, valves, susbsea equipment. Case studies applied to different industries such as Oil and gas, transportation and aerospace and defence industries. The RCM training can be customized to the client demand and be performed together with other training concerning a client cases study assessment. RAM analysis is a quantitative reliability engineering method applied to system level to model the asset performance as well as to define critical equipment which affect such system performance. The RAM analysis predicts the asset performance for a defined period of the life cycle which encompasses all equipment configuration. The performance indexes assessed in the RAM analysis are usually, efficiency production, operational availability and reliability. 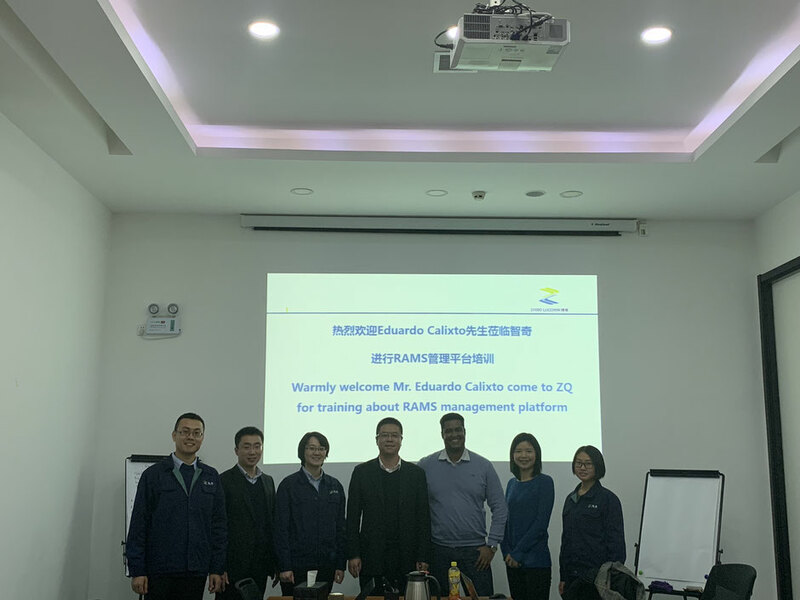 To understand and apply the Reliability, Availability and Maintainability concept as basic of equipment specification and asset performance Index. To understand and implement the Reliability, Availability, Maintainability and Life Cycle Cost (RAM & LCC) methodology a long different asset life cycle phases. To understand the impact of maintenance in system performance. To model the system concerning equipment and component level by applying Reliability Diagram Block (RBD) and Fault Tree Analysis (FTA). To optimize the asset performance based on preventive maintenance, inspection, spare part and LCC optimization. Lifetime data analysis applied to RAM analysis. Sensitivity analysis, such as logistic, spare parts, preventive maintenance impact on asset performance. Asset performance optimization based on preventive maintenance, spare parts and LCC optimization. Case studies applied to Oil and gas, transportation and aerospace and defence industries. The RAM training can be customized to the client demand and be performed together with other training concerning a client cases study assessment. Risk management is a process applied to asset life cycle in order to mitigate the risk of major accident based on hazard identification, risk assessment, risk evaluation, risk mitigation, risk communication and risk monitoring. To understand the Risk concept as basic of Risk assessment and evaluation. To understand the Risk Management concept and its different steps such as hazard identification, risk assessment, risk evaluation and risk mitigation. To understand the Risk analysis methods applied to environment license. To understand the emergency response concept. To understand the Risk Management concept as basic of safe integrity asset performance achievement. To understand the human factor integrated into Risk analysis. Case studies applied to different systems and equipment. Case studies applied to different industries such as Oil and gas, transportation and aerospace and defence. The Risk Management training can be customized to the client demand and be performed together with other training concerning a client cases study assessment. 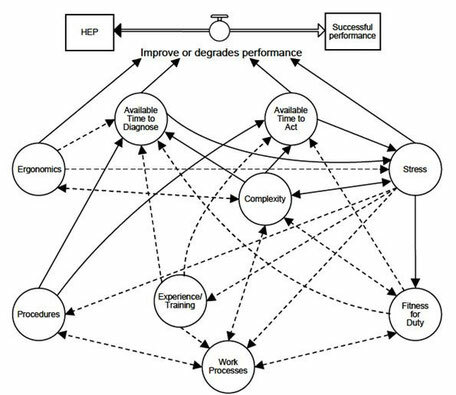 The Human Reliability Analysis (HRA) aims at identifying the human performance factors which take more influence on human error as well as predict the human error probability. Different HRA methods enable such analysis and provide a support for assessment of human error during activities at commissioning, operation and maintenance. The HRA may be integrated with safety assessment, risk analysis, RAM analysis, FMEA and RCA in order to identify the human error as root cause and propose recommendation to mitigate the human error. Identify potential human performance factor which takes influence on human error. To predict the human error probability. To support the FMEA analysis as a baseline to define the human error as a cause of equipment failure mode. To support RAM analysis by including human error in the RBD model. To support RCA by including human error as a root cause of failure or accident. To support Risk analysis by including human error influence on incident or accident. Different HRA methods such as THERP, OAT, SLIM, HEART, SPAH-R, STARH, ASEP, BBN. Case studies applied to human reliability application to risk analysis, maintenance and operation activities. THE HRA training can be customized to the client demand and be performed together with other training concerning a client case study assessment. Human Reliability Analysis Course Final. Asset management (AM) is a process of integrating legal and stakeholder requirement and expectation and enable the physical asset high performance achievement. Therefore, to achieve such high performance, it´s necessary to implement different programs such as Reliability Engineering, Asset Integrity Management (AIM) and Integrated Logistic Support (ILS) along asset life cycle. Finally, with all information concerning logistic, safety, maintenance, reliability and life cycle cost it´s very important to optimize the asset performance. The asset performance optimization enables to define the optimal preventive maintenance and inspection time as well as minimal spare parts and life cycle cost. To understand the Asset Management concept based on ISO 55000. To understand the programs which support asset management, such as Reliability Engineering, Asset Integrity and Integrated logistic support. To understand how to implement the AM program along asset life cycle. To understand how to implement the Reliability engineering program along asset life cycle. To understand how to implement the Asset integrity program along asset life cycle. To understand how to implement the Integrated logistic support program along asset life cycle. An asset management concept based on ISO 55000. Asset management, program evaluation based on ISO 55000 standard concepts. Reliability engineering program as a baseline to AM implementation. Integrated logistic support as baseline of AM implementation. Asset management program evaluation based on ISO 55000 standard concepts. Case studies applied to AM program evaluation, AIM, ILS and asset optimization. THE AM training can be customized to the client demand and be customized to the client demand and be performed together with other training concerning a client case study assessment. Asset Integrity management (AIM) is a process of integrating legal and stakeholder requirement and expectation and enable the physical asset safety high performance achievement. 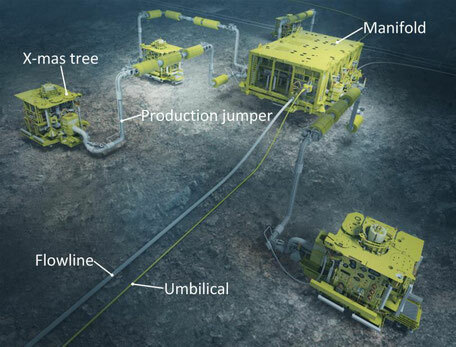 Therefore, to achieve such safety high performance, it´s necessary to implement different programs such as Reliability & Maintenance , Risk Management and Human factors along the asset life cycle phases. • To understand the Asset Integrity management concept as basic of high safety integrity achievement performance. • To understand the Risk Management and risk analysis concept as basic of safe integrity asset performance achievement. • To understand the Reliability and Maintenance concept and its influence on safe integrity asset performance achievement. • To understand the Human factor concept and methods and its influence on safe integrity asset performance achievement. • To implement asset integrity management based on Integrity PRO. LDA is a reliability engineering quantitative method which predicts different reliability index such as reliability, failure rate as well plot the functions associated with such indexes based on parameter of different probability density functions (PDF) defined by the goodness of fit methods. Such methods are based on historical data. To understand the LDA methodology concept as basic of reliability engineering assessment. 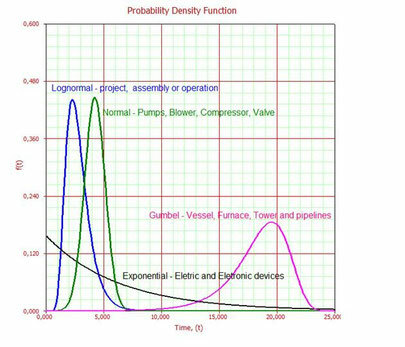 To understand the reliability, failure rate MTTF, MTBF, MTTR concepts. To understand the probability density functions such as Exponential, Lognormal, Logistic, loglogistic, Weibull, Normal, Gumbel , Gama, others. To understand the goodness of fit test such as Plot method, Regression, likelihood, Chi-square, Komogorov Smirnov and Cramer von mises. To understand different specialist elicitation methods. To understand how to build up am equipment failure and repair database. To understand how to collect data from databases to perform LDA. Failure and repair historical data. 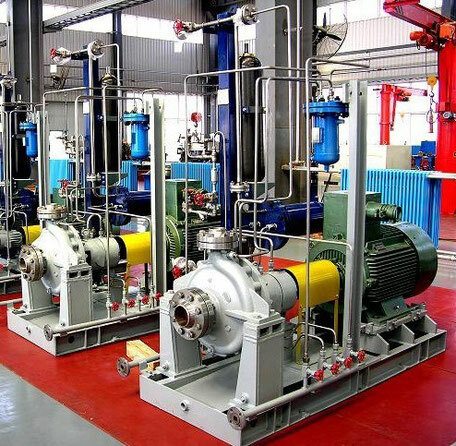 LDA case studies applied to different equipment such as pumps, compressors, valves, susbsea equipment. The LDA training can be customized to the client demand and be performed together with other training concerning a client cases study assessment. · Deliver the Initial Support Package: Decide and procure the facilities, services, tools, spares and manpower required to support the product for a given period. · Acquisition of Product: ILS applies to the acquisition of all products including Technology Demonstrator Programs, major upgrades, software projects, collaborative projects and off-the-shelf procurement. · Supportability of Product (Su): ILS will be applied to ensure that the product is designed to be supportable, that the necessary support infrastructure is put in place. · Requirement for ILS: ILS is still required even when the product selected is already developed, is Commercial Off the Shelf (COTS) or Military Off the Shelf (MOTS), and design. 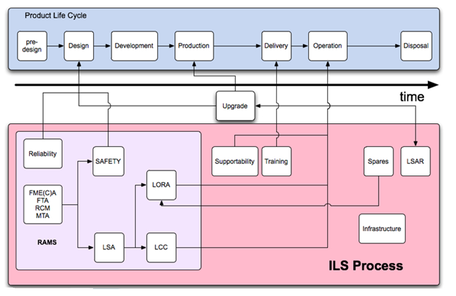 To understand ILS program phases concept as basic of ILS program implementation. To understand the ILS main factos such as Influence on design, Design the support solution, Support package, Acquisition of product, Supportability and requirement. To understand the interaction of RAM programs and ILS program. To understand how to use the result of RAM analysis, FMEA, RCM during LORA and ILS program inplemnentation. To define hte equipment list from system to LRU level. To understand how to assess all information from ILS assessemnt into Life cycle cost and opt. To optimize spare parts and maintenance schedules by minimizing lifecycle cost and/or maximize availability. The ILS training can be customized to the client demand and be performed together with other training concerning a client cases study assessment.